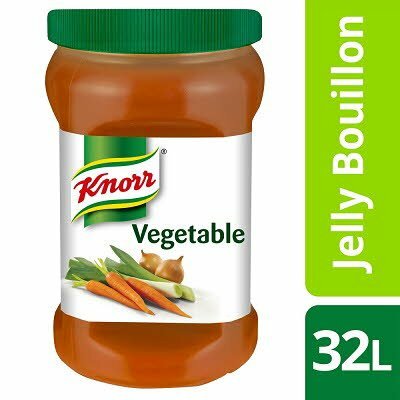 KNORR Jelly Bouillon is as close to scratch and creates the perfect bases. It is voted as best stock by the Chefs Choice awards. Our vegetable flavour jelly bouillon is perfect for creating full flavoured bases. It can be used as a stock for soups and sauces or to add flavour into any dish. Use our bouillon to refine and season your dishes. Our bouillon also comes in other flavours such as chicken, beef, cheese, fish, lamb or mushroom. Product currently not available on webshop. Concentrated vegetable bouillon (71%) [water, carrot, leek, onion], salt, yeast extract, sugar, mushroom juice concentrate, gelling agents (xanthan gum, locust bean gum), flavourings, ground bay leaves. *This product does not contain allergenic ingredients which require declaration under EU regulation 1169/2011 (Annex II). For 1 Litre of bouillon, stir approximately one tablespoon of product (25g) into 1 Litre of hot water and bring to the boil. Simmer for 1 minute. Store in an ambient dry place. After opening use within 1 month. *Indicative price (ex VAT) Product currently not available on webshop.